Please excuse my earnestness: Farmers markets are all good. They support local farmers, they provide high-quality, real food, they get neighbors out walking and meeting their neighbors — they build community in the truest sense of the word. Farmers markets are a wrench in the works of both the corporate food machine, and the corporate don’t-ever-leave-your-house-mindless-entertainment-in-isolation machine. Farmers markets are as wholesome as well, eating your vegetables. Thank you City of Seattle for helping to support farmers markets by lowering permit fees. The photo above is of the Friday farmers market at MLK and Union in the Central District. Just because I can never not find at least a little something wrong with everything, I have to point out the lack of African Americans at this farmers market. There were some, but far fewer than you would expect, given the racial mix of the neighborhood. I’m not sure what to say about this other than I wish it wasn’t so. Part of it is probably socioeconomic — farmers markets aren’t exactly cheap. The issues are complex and sensitive — suffice it to say here that it is a stark reminder of stubborn cultural divisions. Posted by dan bertolet on	Friday, May 23rd, 2008 at 10:41 pm. You can follow any responses to this entry through the RSS 2.0 feed. You can leave a response, or trackback from your own site. 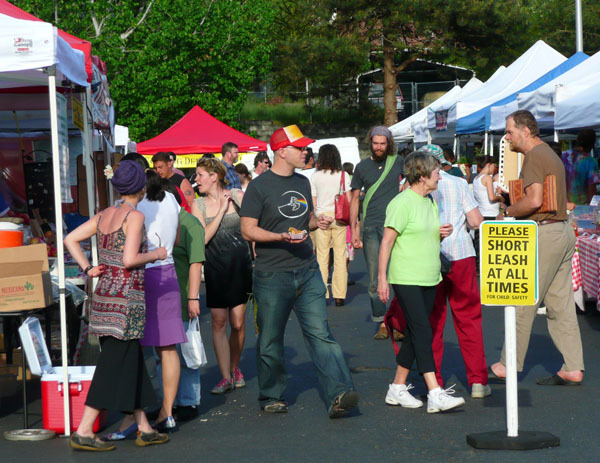 Regarding the price of farmers markets – many Seattle farmers markets accept food vouchers and they donate leftover food to local food banks. And, they do a lot of outreach so that those who use food voucher programs know they can use their benefits at the markets. At an event at my office, a farmer’s market rep claimed that farmer’s markets are actually cheaper than conventional grocery stores. Of course that’s just an apples-to-apples comparison, no pun intended. Most of what you find at a grocery store isn’t available at farmer’s markets, and most of the cheap stuff at grocery stores isn’t healthy at all. Yesterday we enjoyed a visit from an Afro-Caribbean (gosh, I hope that’s the correct phrase) neighbor up the street. She was looking at our garden & comparing what she was growing. Both of our families go to the Farmers Market for things like corn, melons, apples, stuff we don’t grow. But she was complaining yesterday about the price. My impression is like Pollan’s in In Defense of Food: the perceived price is higher, but when comparing prices at the perimeter of the store (where you should purchase products, not in the center of the store where everything is highly processed and highly-packaged [for value-added greater margins]), the prices aren’t that much higher, and you get to talk to people. There are a lot of thinks I simply will not buy at a supermarket because their products taste awful. Strawberries, for example. I can stop by the local Hmong-owned family farm and eat juicy, flavorful, fresh berries…or I can eat styrofoam pellets. Same with cherries (Cherry season is here! I ended up buying $7 worth Saturday!). we’ve found that most of these markets around seattle are more about the sale and connsumption of trinkets and crap than things of value and farm products, unfortunately.